The new DGR1 gauge from Enerpac. 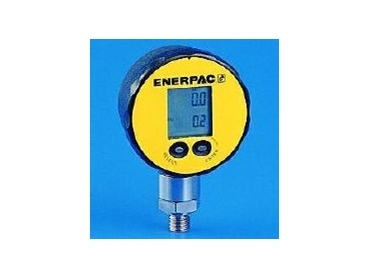 AN easy-to-read digital hydraulic pressure gauge has been released by Enerpac for applications requiring enhanced accuracy and safety when monitoring and controlling hydraulic systems at pressures from 0-1000 bar (15,000psi). The new DGR1 gauge - accurate to within 0.2% - is suitable for precise measurement and recording of hydraulic tool pressures. The versatile battery-operated gauge displays in bar, mbar, kPa, psi and kg/m2 (kg/cm2), switching readily between measurements by pressing buttons on the instrument's face. The unit’s measurement display can be rotated 355 degrees for easy reading and use in all positions. The DGR1 incorporates zero reset functionality, which is used to ensure the gauge reads actual system pressures regardless of environmental factors such as changes in temperatures that could otherwise cause false readings. The instrument also retains maximum and minimum pressure readings regardless of which of its two modes of operation are in use: continuous display or automatic shutoff after 15 minutes. The battery supplied provides 1400 hours of operation in standard mode, with this long life complemented by the instrument's IP65 battery life protection.